Package Deal = SAVE NOW!!! A SUPER-strong, versatile & affordable space saving solution; great for any bedroom! AND the Full Size Mattress is Included in this offer! 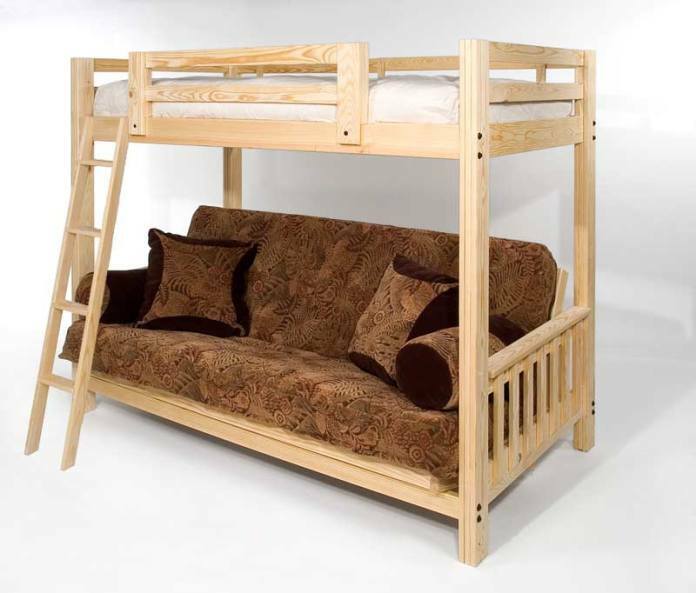 The Freedom Futon Bunk is a phenomenal space saver and adds tremendous value to any room. It comes with a ladder and sleeps three people; one on top and two on the bottom. The top bed takes a standard Twin size futon or mattress while a Full Size futon mattress is needed on the bottom. Our patented, EZ to convert frame design allows for effortless conversion from a couch to a bed and back again (and requires zero clearance). In addition, this same design features two recline positions for the ultimate in lounging comfort. The strength of the Freedom Futon Bunk is truly incredible, with a maximum capacity of over 1,000 lbs., and represents one of the very best values you will find. 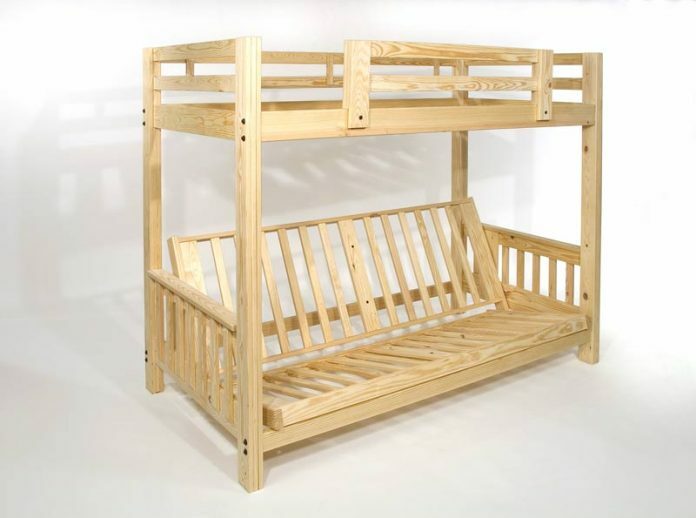 Built with Premium Southern Yellow Pine, this bunk is clean and chemical free and comes unfinished. It can be used as is or is ready to stain or paint, making it EZ and affordable to personalize any room! 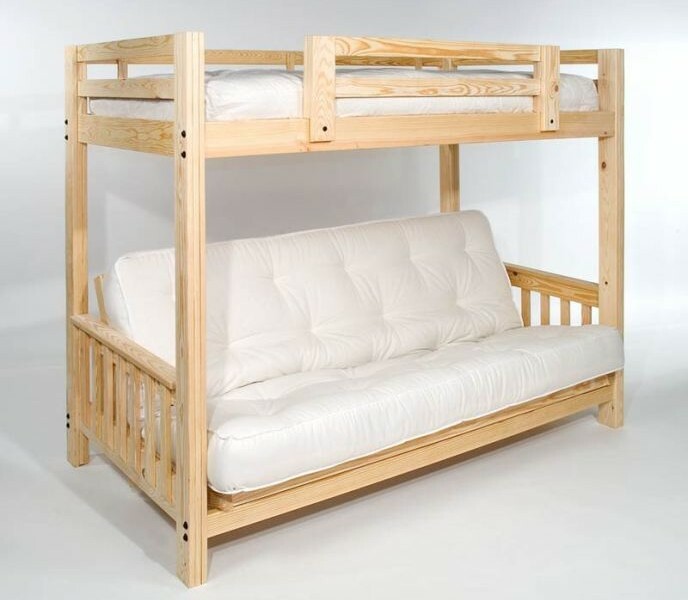 So if you’re looking for a beautiful, super-strong solid wood bunk bed frame and want a comfy sofa-bed to boot, look no further. The Freedom Futon Bunk stands alone, and it can be yours for an affordable price. • Saves Space and Sleeps Three Comfortably – Great for Children or Adults! • Frame Weight: 225 lbs. • Frame Capacity: Over 1000 lbs! Covers are Not Included in this Special Offer, but we have a wide range of reasonably priced options for Solid colors. To add one to your purchase call for selection/ pricing details. 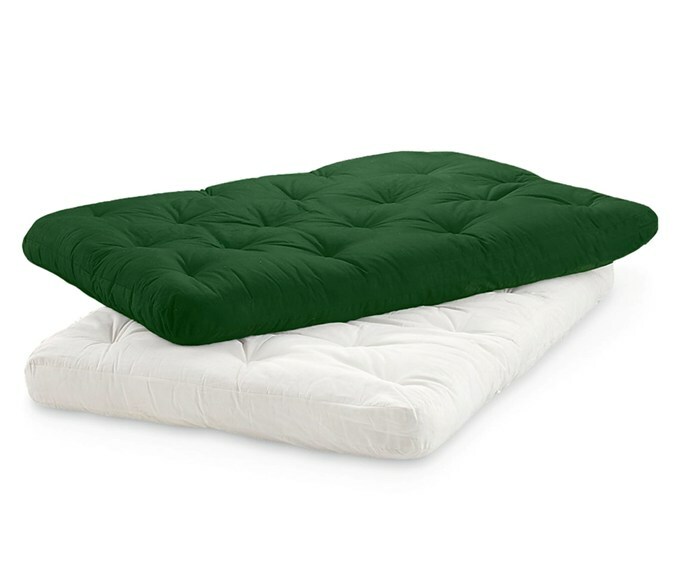 Without a cover your mattress will be Green if the 8 Inch, and White if the 9 Inch. See our Selection of Accessories Available: We have matching Dressers, Nightstands, Tables, Bookshelves, Clip on shelves, and Much More! 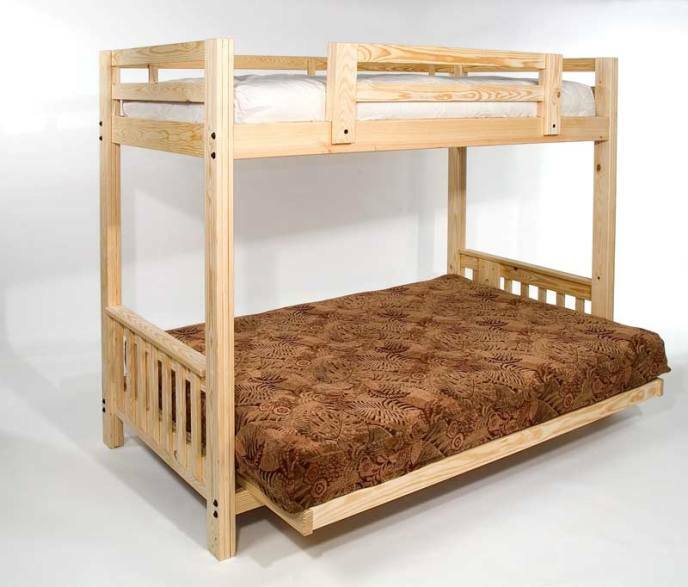 We can also provide for your mattress needs for the Top Bunk, which uses a twin 38 x 75 Mattress. Our Mattress Selection ranges from basic, inexpensive children’s mattress to organic latex mattress. We have it all!